One of the best parts about living in or visiting a university town is the influence the university and its students bring. Not only does the university attract bright, young and creative minds, it also brings great events and opportunities for the community to come together and root for a common cause. A lot of times, that cause is the athletic teams at UW-Eau Claire. Go BluGolds! All of the sporting events are family friendly and full of the classic Eau Claire spirit. So grab your blue and gold attire and get ready to cheer, because Blugolds are here to win. There is no lack of sporting events to attend, that&apos;s for sure. 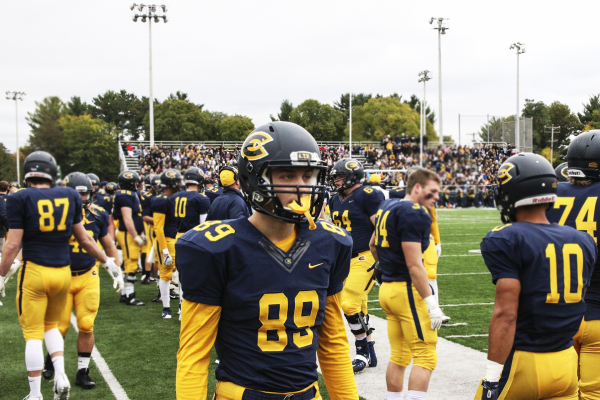 UW-Eau Claire has everything from football to hockey to swimming and everything in between. A perk of the football games? You&apos;ll get to see the nationally recognized Blugold Marching Band perform at Carson Park during halftime. Now that&apos;s a show you won&apos;t want to miss, so you&apos;ll have to find another time to load up on your goodies from the concession stand.